Chelsea survived a late scare to progress into the Semi Finals of the Champions League for the first time in three years. Javi Garcia’s header in the 84th minute took the score on the night to 1-1 and meant, for the first time in the tie, Benfica were a solitary goal from progressing. Another goal did come but thankfully for the understandably nervous Chelsea fans it came from the right boot of Raul Meireles in injury time. The reward is a double header with Barcelona, and of course a repeat of that epic encounter in 2009 in which the Catalans eventually progressed to face Manchester United. Roberto di Matteo made just one change from the eleven which started in the 4-2 win at Villa Park on Saturday with Ramires coming in to replace Daniel Sturridge. Benfica were without both their centre-backs from the first leg, Luisao and Jardel, forcing Emerson, victim of Ramires’ pace in the first leg, into the middle. Former blue Nemanja Matic started in midfield for the visitors. It was the Lisbon side who were faster out of the blocks with a prolonged period of possession in the opening stages, helped by their vociferous travelling support. 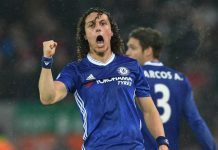 Chelsea seemed to be sitting deep and adopting a counter-attacking approach which did bring chances and space behind Benfica’s backline. Mata finished with aplomb from a neat Kalou pass but was ruled offside before nearly picking out Torres through on goal. A fine lofted ball from John Terry found Ashley Cole in the box and he was bundled to the ground by Garcia before he could do anything more with the ball: penalty. Lampard fired it into the corner under the despairing dive of Artur and Chelsea doubled their lead in the tie. Benfica were still dominating possession and nearly levelled instantly but Cardozo’s shot was cleared off the line by Terry with Cech well beaten. Benfica then made their task even harder when Maxi Pereira, captain for the night, slid through the back of Mikel and picked up his second caution of the evening. The first was for dissent following the penalty award – only 39 minutes had been played. Chelsea went into the break having created precious little but with a man and a goal advantage. However Benfica had undoubtedly improved their level of performance from the first leg and looked dangerous more often than not. Moments into the second period Cech pulled off a wonderful save from a curling Cardozo effort which looked destined for the top corner. Then Ramires inexplicably failed to turn Kalou’s effort across the goal into the net from barely inches out. Torres almost rendered that miss worthless when he turned brilliantly but his shot was deflected just wide. The exit of Terry to injury, replaced by Cahill, and the introductions of Oliveira and Djalo seemed to swing the momentum back in favour of the Portuguese side. Djalo had a shot deflected just wide before heading over as the Chelsea defence started showing a hint of the jitters which had undone them so spectacularly in Naples. At the other end Kalou missed a decent one-on-one opportunity before taking the ball off Mata’s toes only to fire wide. 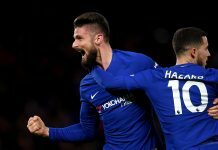 Chelsea’s profligacy was punished six minutes from time when Garcia stole in to head home from a corner and ensure a nervy ending to a tie which could have been put to bed long before. With the Stamford Bridge faithful on edge and the Blues showing signs of nerves themselves memories of Champions League heartbreak in the past, from the 5-1 disaster in the Nou Camp in 2000 through to Iniesta’s wonder goal in 2009, resonated. This tale was to have a happy ending though. A Benfica free-kick was cleared and substitute Meireles ran the length of the pitch to thrash the ball past Artur and seal Chelsea’s place in the Semi Finals of the best club competition in the world. They will be joined by three giants of the game: Real Madrid, Bayern Munich, Barcelona. Two games against arguably the greatest club side in history could well prove a step too far but just to have got this far is testament to a squad of players and a temporary manager that still have something to prove at the very top level.